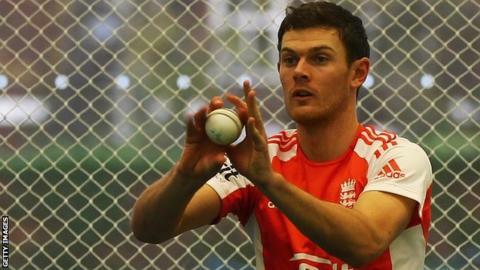 England have called up uncapped Welsh seamer James Harris for their three Twenty20 internationals in New Zealand. Harris, 22, will be cover for Stuart Meaker, who missed England's opening warm-up match against a New Zealand XI in Whangarei because of a neck strain. The game was abandoned after 9.1 overs with New Zealand on 70-1 and a new game has been arranged for Tuesday. Middlesex's Harris was already called up for England's squad for the three-match one-day series. Stuart Broad returned for the warm-up game from the bruised heel, which forced him out of England's Twenty20 two-match series in India. But the captain managed just seven deliveries before rain intervened. Chris Woakes took the only wicket, when Hamish Rutherford mistimed an attempted pull and Broad took the catch running back at wide mid-on. There was confusion over wicketkeeping duties, with Jos Butler taking the gloves after fellow wicketkeeper-batsman Jonny Bairstow said in a TV interview that he would be doing it. England Test squad: Alastair Cook (capt), Nick Compton, Jonathan Trott, Kevin Pietersen, Ian Bell, Joe Root, Jonny Bairstow, Matt Prior, Chris Woakes, Stuart Broad, Graeme Swann, Steven Finn, James Anderson, Monty Panesar, Graham Onions. England Twenty20 squad: Stuart Broad (captain), Jonny Bairstow, Danny Briggs, Jos Buttler, Jade Dernbach, Steven Finn, Alex Hales, James Harris, Michael Lumb, Stuart Meaker, Eoin Morgan, Samit Patel, James Tredwell, Chris Woakes, Luke Wright. England ODI squad: Alastair Cook (captain), James Anderson, Jonny Bairstow, Ian Bell, Stuart Broad, Jos Buttler, Steven Finn, James Harris, Eoin Morgan, Samit Patel, Joe Root, Graeme Swann, James Tredwell, Jonathan Trott, Chris Woakes.